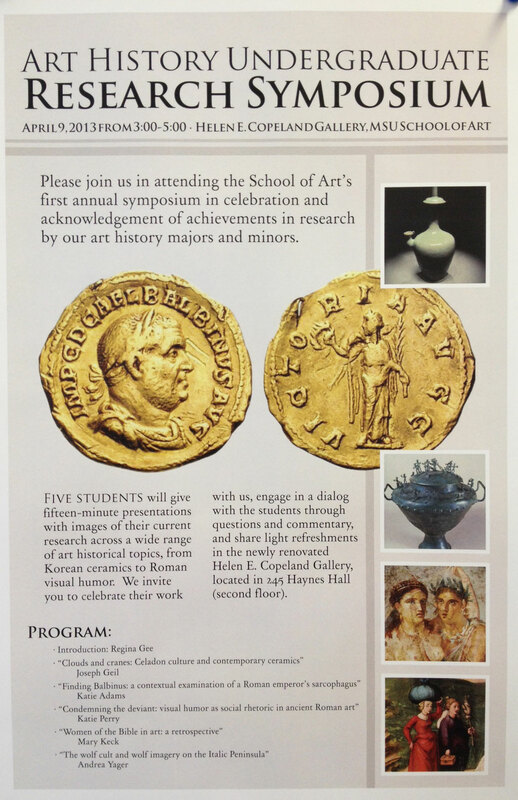 Please join us in attending the School of Art’s first annual symposium in celebration and acknowledgement of achievements in research by our art history majors and minors. Five students will give fifteen-minute presentations with images of their current research across a wide range of art historical topics, from Korean ceramics to Roman visual humor. We invite you to celebrate their work with us, engage in a dialog with the students through questions and commentary, and share light refreshments in the newly renovated Helen E. Copeland Gallery, 245 Haynes Hall (second floor).